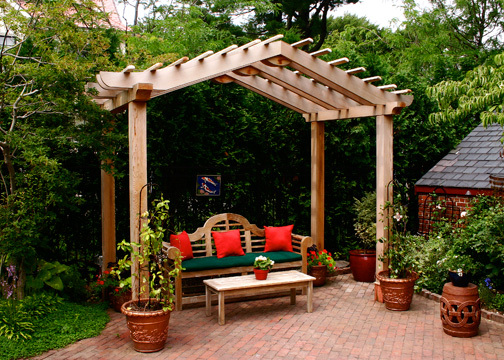 This Asian style pergola was designed to complement the architecture of the owners' house as well as fit comfortably within the Japanese style garden. While the structure is small, it offers a dramatic accent within the scale of the space, employing clean lines and distinctive detailing. 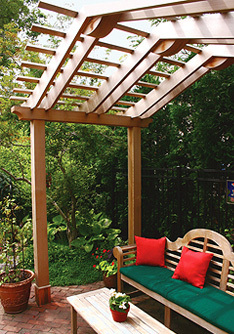 The purlin overhangs are different lengths calling to mind roof designs in Asian structures. The copper "boot" around the post base will help keep the wood from turning a darker shade, where it receives the most water exposure. The copper will turn a dark brown and blend naturally with the bricks of the patio.